Every year on the 7th of April the global health community is celebrating ‘World Health Day’. The awareness day was first created by the World Health Organisation (WHO) in 1950 and is seen as an opportunity by the organization to draw attention to a subject of major importance in global health each year. This year’s theme is universal health coverage (UHC) and the Fight the Fakes campaign wishes to mark the occasion by highlighting the link between falsified and substandard medicines and the goal of achieving universal health coverage by 2030. Yet for this goal to remain tangible, the link between falsified medicines and UHC has to be recognized and action has to be taken! 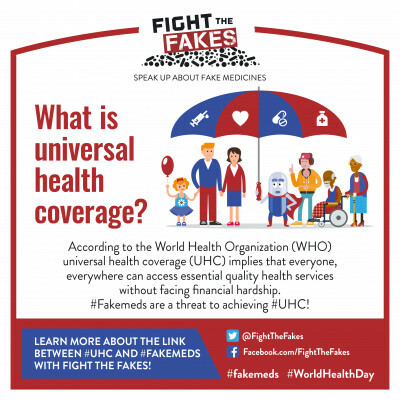 So, what exactly links falsified medicines to UHC? 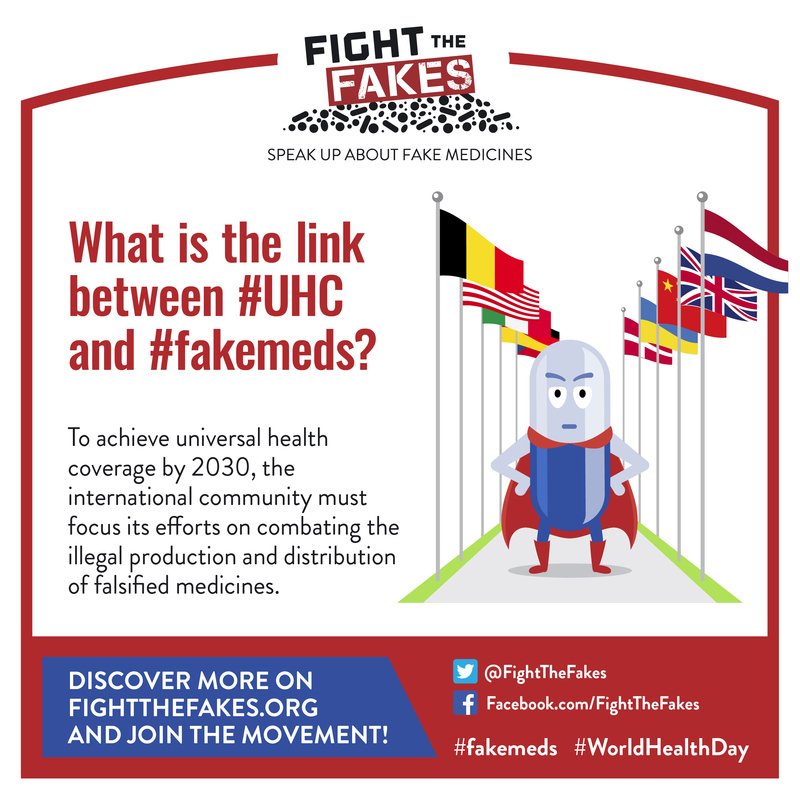 Falsified medicines have serious health, social and economic implications which severely obstruct the road to universal health coverage and people’s access to safe and high-quality medicines. 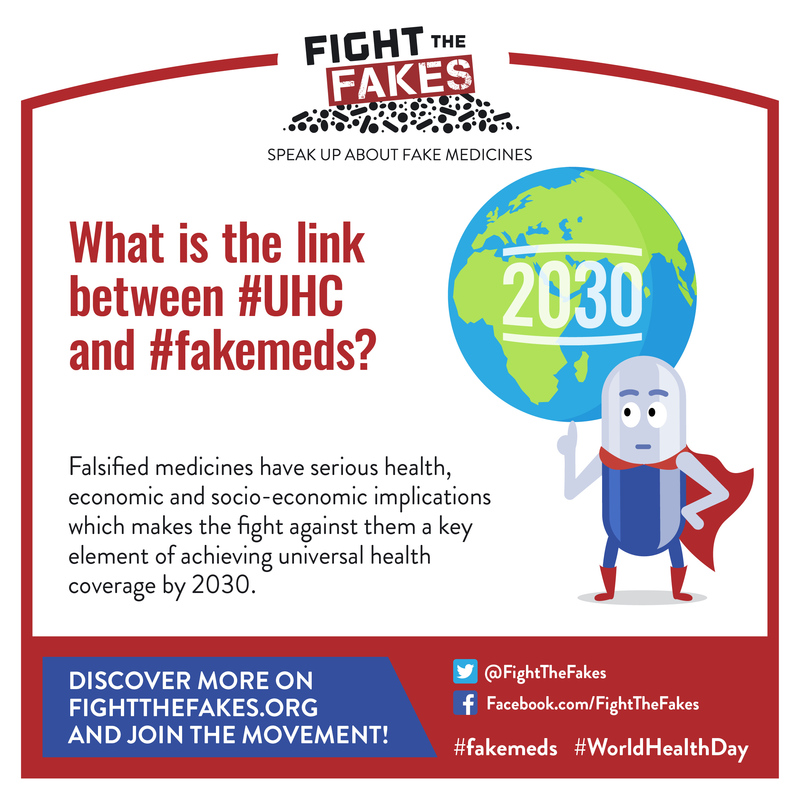 For these reasons the fight against fake medicines is a critical component of achieving UHC by 2030. If medicines are not available, affordable or of poor-quality and basic health care services are not set in place, the spread of falsified medicines, particularly in the most affected regions – sub-Saharan Africa and the Mekong region – will be difficult to contain. Therefore, during this year’s World Health Day, we want to urge the international community to recognize the crucial role falsified medicines play in achieving UHC and they must include in their efforts measures to combat the illegal production and distribution of falsified medicines. 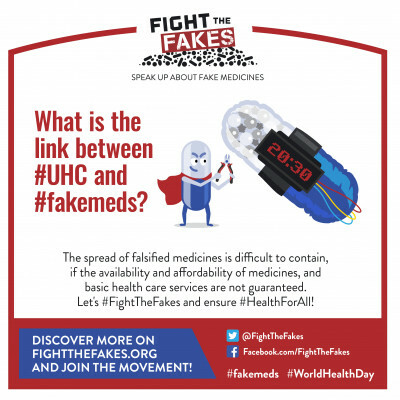 Join our awareness raising efforts by sharing our social media cards on Facebook or Twitter and inform your friends and family about the dangers of falsified medicines! 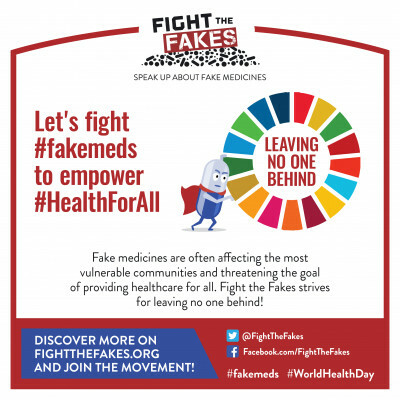 Stay safe from #fakemeds on #WorldHealthDay – they critically endanger #patientsafety, and can lead to further illness, disability or even death! 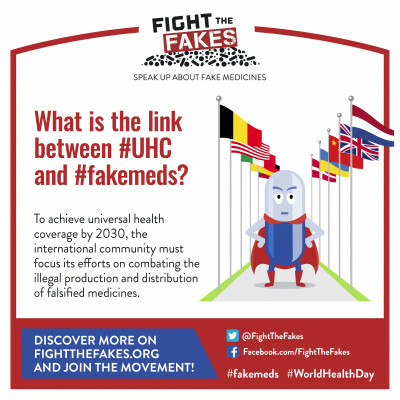 For #WorldHealthDay we want to raise awareness about the need to fight #fakemeds in order to achieve #HealthForAll! The criminal network of #fakemeds is boundless. 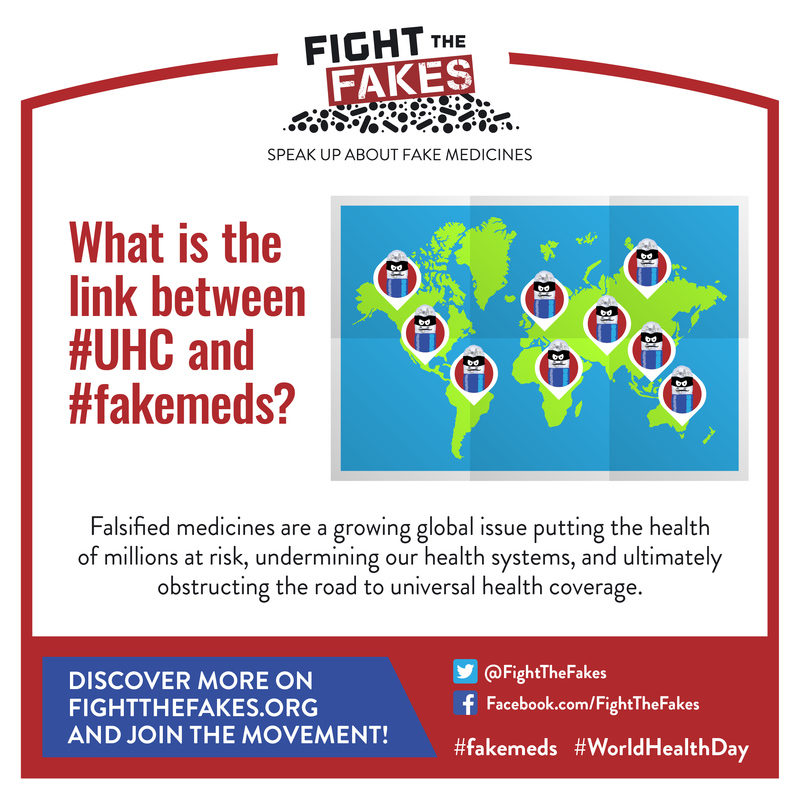 Raise awareness about falsified medicines on #WorldHealthDay with us! 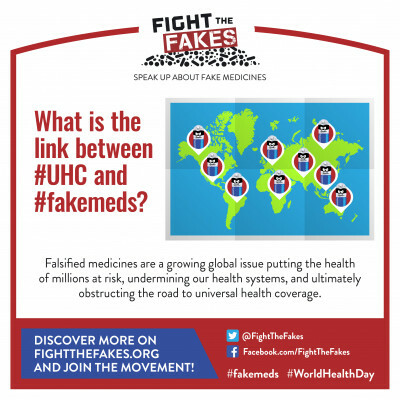 #FightTheFakes on #WorldHealthDay and speak up against #fakemeds! On #WorldHealthDay raise awareness about #fakemeds contributing to the development of #AMR which in turn threatens people’s well-being! 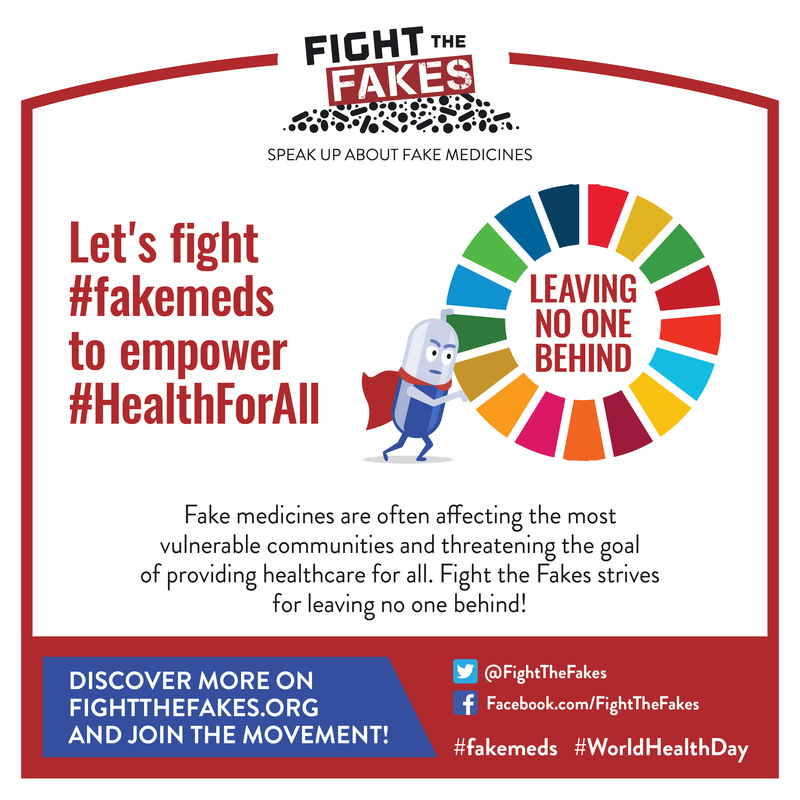 Make a stand on #WorldHealthDay and speak up about #HealthForAll and the importance of fighting #fakemeds!